Areca-triandra, Triandra Palm, also known as Wild Areca Palm, is a fast growing clumping palm that originally came from low level rain forests in India and southeast Asia. It likes constantly moist, well drained soil, though not wet. Try to place it where the conditions are as close as possible to its natural habitat, in shade or even deep shade. 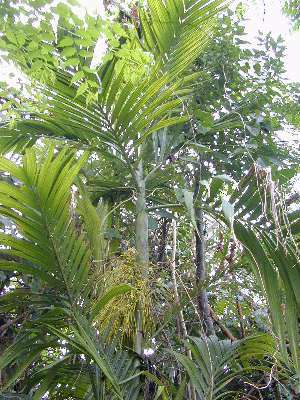 It's a delightful palm that produces attractive 6 foot feather shaped fronds on top of a slender 2 inch diameter trunk that can grow to 16 feet. This attractive palm can also be used as a house plant in cooler climates or in a pot on a patio.